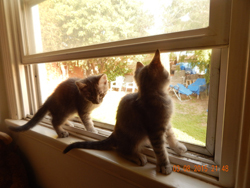 Home » Pet Adoptions » Kittens need loving home! I have two beautiful male gray tabbies. They are 3 months old. Healthy, playful, loving and deserve a good home. We are keeping the mother and two other kittens from her litter, otherwise I would love to keep the two boys too, but we don’t have the room. They love to play with their toy mice, chase their tails and each other. They are litter box trained and have never gone outside. They are very sweet and deserve a loving person or family to adopt them. Blessings on you, and the little ones!